With the explosion of devices, computing platforms, contextual conditions, user interfaces become more confronted to a need to be adapted to multiple configurations of the context of use. In the past, many techniques were developed to perform a task analysis for obtaining a single user interface that is adapted for a single context of use. As this user interface may become unusable for other contexts of use, there emerges a need for modelling tasks which can be supported in multiple contexts of use, considering multiple combinations of the contextual conditions. For this purpose, the concept of unit task is exploited to identify a point where traditional task models can break into two parts: a context-insensitive part and a context-sensitive part. A widespread task model notation is then used to examine, discuss, and criticise possible configurations for modelling a context-sensitive task as a whole. One particular form is selected that attempts to achieve a clear separation of concern between the context-insensitive part, the context-sensitive part, and a new decision tree which branches to context-sensitive tasks, depending on contextual conditions. The questions of factoring out possible elements that are common across multiple contexts of use and representation of the resulting task model are discussed. G.G. Abowd and A.D. Key. Towards a better understanding of context and context-awareness. Technical Report Research report 1999-22, Georgia University of Technology, 1999. Accessible at ftp://ftp.cc.gatech.edu/pub/gvu/tr/1999/99-22.pdf. M. Abrams, C. Phanouriou, A.L. Batongbacal, S. Williams, and J. Shuster. UIML: An appliance-independent XML user interface language. In A. Mendelzon, editor,Proceedings of 8th International World-Wide Web Conference WWW’8 (Toronto, May 11–14, 1999), Amsterdam, 1999. Elsevier Science Publishers. 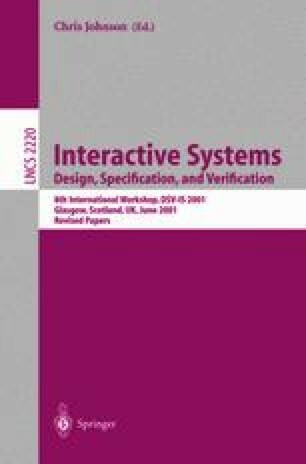 Accessible athttp://www.org/w8-papers/5b-hypertext-media/uiml.html. B. Myers, S. Hudson, and R. Pausch. Past, present, future of user interface tools. ACM Transactions on Computer-Human Interaction, 7:3–28, 1. Accessible at http://www.acm.org/pubs/articles/journals/tochi/2000-7-1/p3-myers/p3-myers.pdf.